After suffering a disastrous start to their ISL campaign with three consecutive losses, Atletico de Kolkata have become the first team to enter the semi finals of the 2015 Indian Super League. Kolkata's 4 - 1 home win over FC Pune City at the Salt Lake Stadium on Friday, 27 November secured their passage. 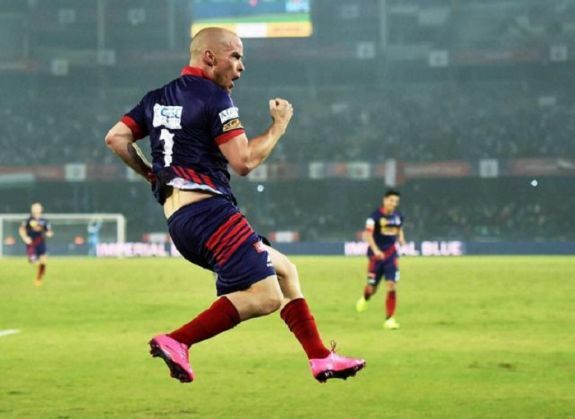 Iain Hume scored his second hattrick for the Atletico Madrid owned side against Pune, taking his goal tally to 9 - one behind Stiven Mendoza of Chennaiyin FC. The match could have been a lot closer than the scoreline reflected, as Pune came agonizingly close to scoring on two occasions - Adrian Mutu and Yendrick Ruiz hitting the goalpost in the 23rd and 52nd minutes respectively. Speaking about his team's turn in fortunes, Kolkata coach Antonio Lopez Habas said, "Our training in Madrid is now bearing results. What we have achieved is a combination of discipline, hard work and talent." FC Goa, Delhi Dynamos and Northeast United FC currently occupy the other three spots in the top 4, but are yet to mathematically secure qualification.